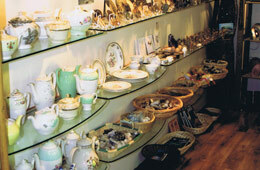 We sell a very diverse range of items in our Gift Shop. These include: Bird and Nature books,Cycling and Walking guides. Minerals, Cystals and Fossils,Paintings by local artist, plus a good selection of Jewellery. Locally made Jams and Chutneys and many other things! The gift shop is located in our our beautiful orchard and offers great gifts for all ages! If you are looking for something special then our Gift Shop is for you. From 5 million year old Fossils to locally designed Jewellery, Paintings by local artist Hannah Hamley,our jars of Cornish Chilli Jam and Apple & West Country Cider Chutney are also very popular. Informative Guides and Books on the local area and Camel Trail. Produced locally we also sell bottles of award winning Wines & Cider. Phone: 01208 74291 If you require more details.